Growing spring Beans in Ireland has become very popular in the last number of years due partly to the protein payment available but also the fact that beans can provide an excellent break in a cereal rotation with increased yields in a following cereal crop. 2017 also proved that Beans can be a very profitable crop with the right management. We are learning more about the agronomy of beans every year and the better our management gets the higher the yield potential. Sowing date is important and depends very much on soil type and soil moisture. Seeding rate is also very important. The target population for Spring Beans is 30-35 plants per m2; this equates to a seeding rate of 35-40 seeds/m2 at 90% germination. 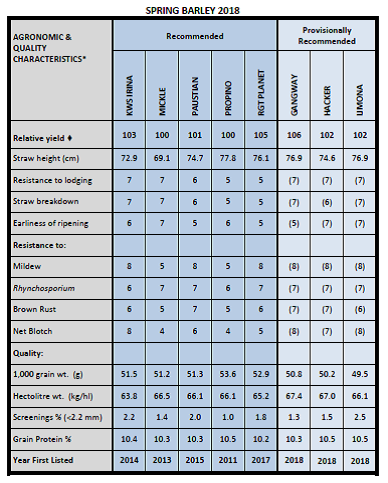 It’s very important to know the thousand seed weight of the variety you are sowing as this has a huge influence on kg/ha or stone/acre of seed sown. Fanfare will be the main bean provided. Spring Cereals: Quinns have an excellent selection of spring cereal seed available whether you are hoping to sow barley, oats or wheat. The spring barley varieties available are: Mickle, KWS Irina, Propino, Paustian and Planet. The average spring barley yield has increased significantly in the last number of years and all of these varieties are excellent yielders. Although Planet is the highest yielder at a relative yield of 105; it is weaker on straw breakdown and needs extra attention coming up to harvest. Propino is now the oldest variety on the list but has been very consistent on a lot of farms over the last number of years. It is predicted that there will be increased demand for spring barley due to the fact there wasn’t as much acres of winter cereals sown. It is important for anybody looking for specific varieties with specific seed treatments to order seed early. In relation to oats we have the ever popular and high yielding Husky. Download our full Technical Newsletter…….. This entry was posted in Farming News, News on February 9, 2018 by quinns.